Snippets of Jack: "Depends On The Light"
Jack must have gotten his craziness from somewhere? Of course, "Not a lot's known about Jack Sparrow before he showed up in Tortuga with a mind to go after the treasure of the Isla de Muerta. That was before I'd met him, back when he was captain of the Black Pearl." -Gibbs. So for the first two movies they don't mention Jack's past much. Everyone assumes he's just wierd because he usually is drunk. But in The Pirates of the Caribbean: At Worlds End we start to wonder if Jack is Jack because of genes. His father, Edward Teague, shows up at the Brethren Court as they argue about the king of the Pirate Lords. Teague is the keeper of the pirate code. Jack is just delighted to be reunited with his father. Jack and his father have a good father-to-son bonding time in the cove. Captain Jack: "What? You've seen it all, done it all. You survived. That’s the trick, isn’t it? To survive?" Teague: "It’s not just about living forever, Jackie. The trick is living with yourself forever." Jack then asks about how his mother is doing. I'm guessing her last name is Sparrow, because Jack isn't Captain Jack Teague. He just holds up a little, shriveled up head. Good to see mum again, right Jack? 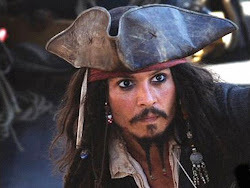 Jack really heads his father's advice about wanting to live forever in The Pirates of the Caribbean: On Stranger Tides. After saving his son's life, Teague and Jack go to their favorite place: a bar! Teague: "I heard where you're headed. The Fountain." Jack: "Have you been there?" Teague: "Does this face looks like it's been to the Fountain of Youth?" Jack: "Depends on the light." Oh Jack, always so polite. Teague: "Find out every detail before you set sail." Jack: "Set sail? I'd love to, but for that I may need a ship." Teague: "Those folk over there. They have a ship. They're signing up sailor over there." Smooth. You just sent your son over only to get himself imprisoned upon the Queen Anne's Revenge. Such a great role model. Teague: "And one last thing, Jackie. The Fountain tests you. Mark my words." Edward and Jack, like father like son.